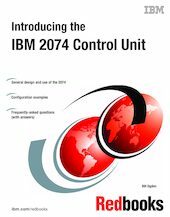 This IBM Redbooks publication explains the design and use of the IBM 2074 Control Unit, based on ITSO experience with an early version of the 2074. A 2074 can be used with any S/390 operating system; however, this document discusses only its use with OS/390. The 2074 typically replaces multiple local IBM 3174 Control Units to provide local connections for 3270 displays. In particular, one 2074 Control Unit can provide local 3270 connections for multiple LPARs, where the local 3270 sessions can be used for MVS consoles and VTAM applications such as TSO and CICS. This book describes typical customization controls for the 2074 and connected S/390 machines. This book assumes the reader is familiar with detailed S/390 and OS/390 terminology and uses such terminology without additional definitions.